Location: Immediately west of the Merchants' Railway (now a footpath) within the Ocean Views Development. Although the first recorded use of the halt is c 1925 the 1902 Ordnance Survey map (reproduced below) shows what appears to be a platform on the down side east of the girder bridge. This is not shown on any later maps. In 1922 there were 18 daily trains in each direction with five extended to Easton. Once again these trains were badly timed with the first train leaving Easton at 9.25am ensuring that the line could not be used by commuters. This problem was finally resolved in the summer of 1924 when an early morning train brought the daily tally at this end of the branch to six. 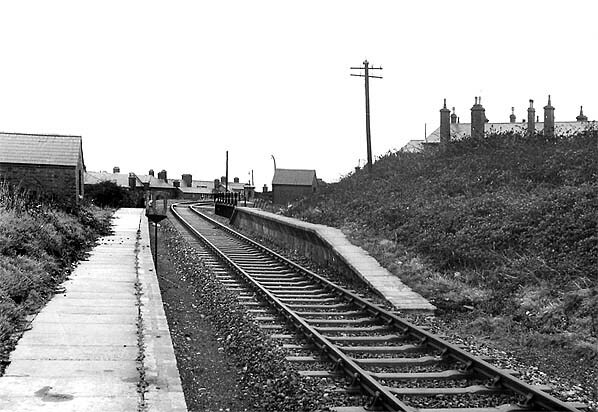 Portland Hospital Halt looking north-east c1960s; the girder bridge over the Merchants’ Railway is seen beyond the platforms. For some unknown reason the halt had two platforms, but only the shorter 60ft platform on the up side was alongside the track. Similar brick buildings wereprovided on both platforms. 1902 1:2,500 OS map. What appears to be a platform is shown on the down side of the line to the east of the Merchants’ Railway. This ‘platform’ does not appear on later maps. 1960 1:2,500 OS map does not show either platform although the brick building standing at the end of the unused platform is shown. 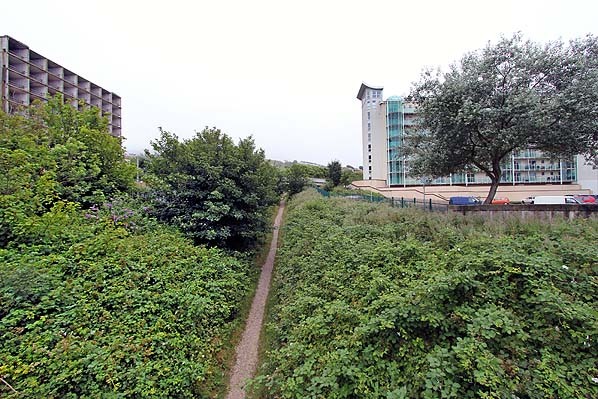 Looking south-west at the site of Portland Hospital Halt in July 2013. 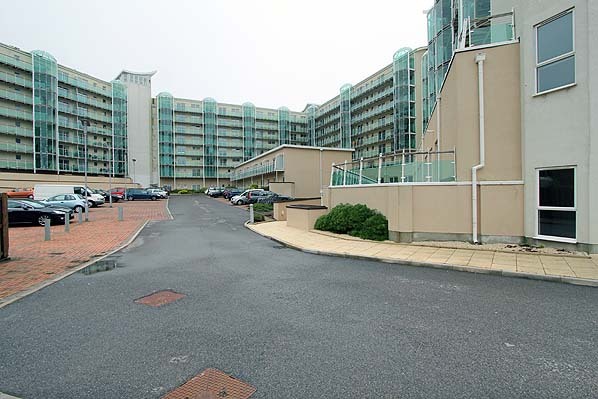 The road and car park within the Ocean Views Development now occupy the site. Looking south up the cable-hauled Merchants’ Railway incline from the new bridge which gives access to the Ocean Views Development. The girder bridge that took the Easton line over the incline was in the foreground with the site of Portland Hospital Halt out of view to the right. 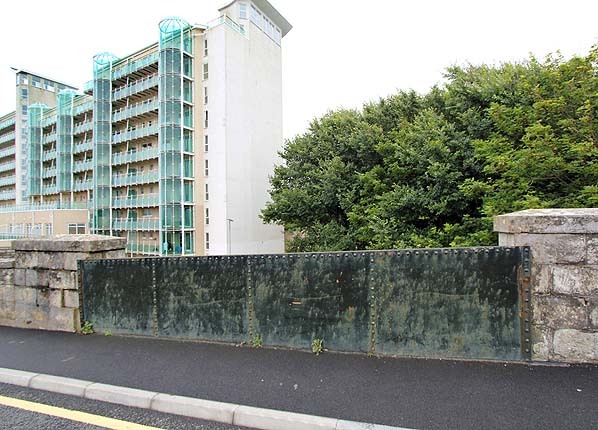 The building on the left is a gutted accommodation block for the Portland naval base. All evidence of the Easton line has been obliterated in Castletown with the exception of this bridge that took Castle Road over the line. 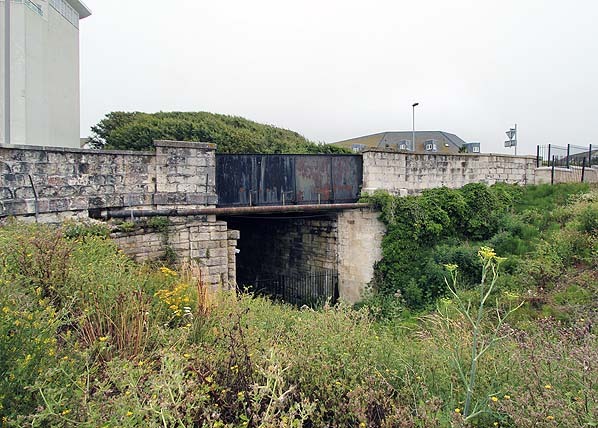 Once under the bridge the line ran into Portland Hospital Halt, the site of which is now lost under the Ocean Views Development (July 2013). Castletown Road bridge in July 1969. Castletown Junction was beyond the bridge with the Easton line running straight ahead and Castletown sidings to the left. The Admiralty Railway started on the far side of the bridge.